Kalispell, MT — Montana Fish, Wildlife & Parks captured a male grizzly bear south of Condon and euthanized the animal because it was food conditioned and had a history of approaching residences. FWP personnel captured the bear on the night of July 2 with a culvert trap off Montana Highway 83 in Condon. The bear was estimated to be 3 years old and weighed 299 pounds. The bear was originally captured incidentally in the summer of 2017 on the Flathead Indian Reservation after a different grizzly bear killed several llamas and chickens. Personnel with the Confederated Salish & Kootenai Tribes Wildlife Division fitted the bear with a GPS radio collar for future monitoring and moved the animal within its home range to the Mission Mountains. The bear was recaptured within 10 days after getting into unsecured food attractants. The bear was moved once again, this time south of St. Ignatius. It spent the last year travelling through Evaro, Arlee, the Placid Lake area, Seeley Lake and the Swan Valley, where it began accessing unsecured attractants, including garbage and chicken feed. The bear’s history of reported incidents includes breaking into structures in search of food, pulling a hunter-harvested deer from a shed, and killing several chickens. FWP received numerous reports of the animal approaching residences, entering sheds and getting into garbage and chicken feed. It had dropped its GPS radio collar but its identity was confirmed by a microchip upon capture. Due to the bear’s conflict history and habituation, FWP made the decision to euthanize it on July 3 in consultation with the U.S. Fish and Wildlife Service and in accordance with Interagency Grizzly Bear Committee guidelines. This incident demonstrates that wild animals may become habituated to people, posing a serious risk to public safety. When responding to a conflict involving bears, FWP follows guidelines associated with the incident that inform an appropriate action. These factors include the potential human safety threats, the intensity of the conflict and the bear’s history of conflicts. Putting down an adult bear is always a last resort. 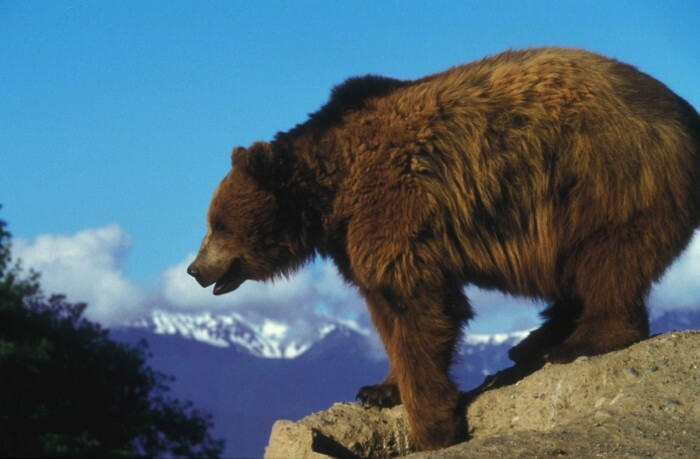 Northwest Montana is bear country with abundant populations of grizzlies and black bears. Residents are asked to remove or secure food attractants such as garbage and bird feeders and bird seed. Chicken and livestock should be properly secured with electric fencing or inside a closed shed with a door. Recreationists are urged to “Be Bear Aware” and follow precautionary steps and tips to prevent conflicts.